This is the second version - Ver 2.2, assembled and ready to use PCB for Wah pedals. It is designed for installation in standard enclosure "Wah." Wah-wah-watson based on the classic schematics, like most pedals equipped with a potentiometer and the inductor. The classic version of schematic has been modified several times by many manufacturers. Wah-wah-watson is the original mod U-Sound. 1. Availability of external volume control. 2. Signal flow when off effect - True Bypass. 4. The presence of 2 switchable inductors. The latter allows to use the effect with a guitar, baritone and bass guitar. In Ver 2.2 using capacitors best manufacturers and resistors Carbon Comp. And that is very important for sound - selected NOS transistors 2N3415 (release late 60's, early 70's (NOS). It is these transistors were placed in many Wah releases at the time. In the first version - Ver 1.0 used specially selected NOS transistors BC109. Through the listed properties, the pedal will sound exactly the way you want. You can configure it to work as a funk, disco, and in conjunction with the fuzz, overdrive and distortion. Currently available only separately PCB different configuration. Means the replacement stock PCB in the classic version wah pedal. 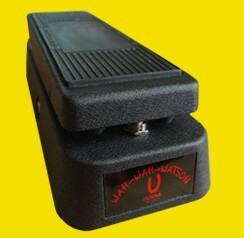 Extra + - Assembled and connected by wires, two coil U-Sound, High Quality Wah POT 125k, 3 PDT Foot Switch. Extra - Still, as in Extra +, but one coil. Appearance of PCB: 1, 2, 3.